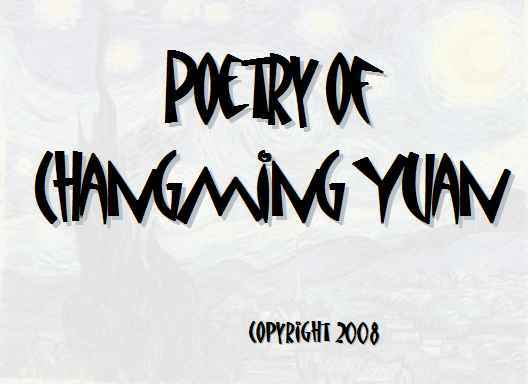 Poetry of Changming Yuan: The Worn Worm, During their Dialogues, What do YOU see then? Copyright 2008, Changming Yuan. © This work is protected under the U.S. copyright laws. It may not be reproduced, reprinted, reused, or altered without the expressed written permission of the author. Changming Yuan grew up in an impoverished village in central China and published three books before moving to Canada. With a PhD in English from University of Saskatchewan, Yuan currently teaches academic writing in Vancouver and has had about 200 poems appearing in such publications as Exquisite Corpse, London Magazine (UK), Porcupine, Private (IT), Sentence, Stylus (AU), SNReview, Thanal (IN) and Vallum (CA).